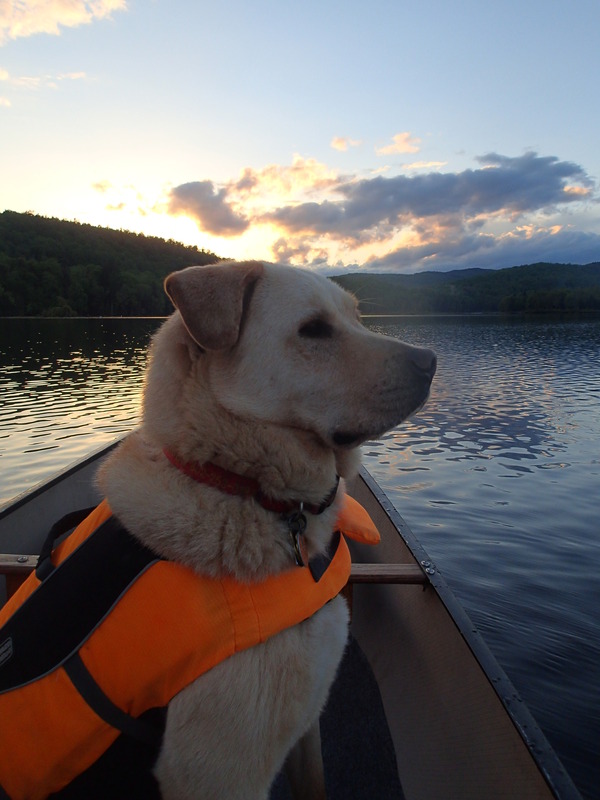 THROUGH HAIL AND HIGH WATER….. | Vermont Paddle Pups! THROUGH HAIL AND HIGH WATER…..
Well, the water was not really high…but it was a bit choppy,as we paddled out into the headwind. Our Swift Kipawa was loaded for a short camping trip at Green River Reservoir State park in northern Vermont. 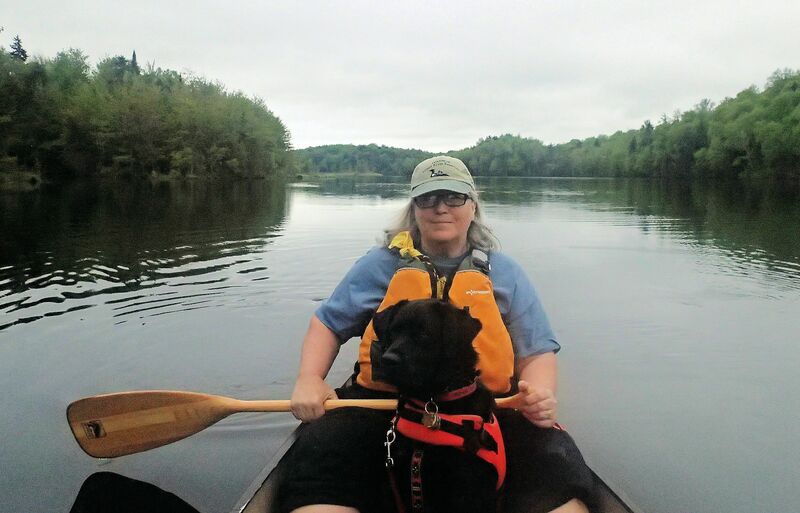 There are 30 (water-access only) sites on this 700 acre pristine waterway…no shoreline development, no motor boats , and only one dirt road to access the park entry. We had eyed site 17 for a few years..the “best” site, so the one that is “never” available . Popping in at the park and taking your chances on getting other sites is fine, but you’ll never get this site (unless you reserve in January, as did we). We had been a bit concerned about weather–the forecast had been for showers with a chance of thunderstorms with high wind. Rain is fine, we’re not wimps after all—but T-storms are a different matter! Lucky for us, the sun broke through, and we were able to load up, and get to our site without issue, accompanied by some of the many loons on this lake. We arrived, and immediately set up the tarp…in case the looming clouds did drop some precipitation. We recently purchased a large tent footprint, added bungees and grommets, to make a modular tarp unit..it worked great! The tent was up, a fire started, and dinner was consumed overlooking the beautiful islands to the north. Then…well, suddenly all “hail broke loose”. The wind was roaring down from the north, and the rain that quickly began, just as quickly turned to hail. The hail gradually increased in size, until it was the size of a large green pea. 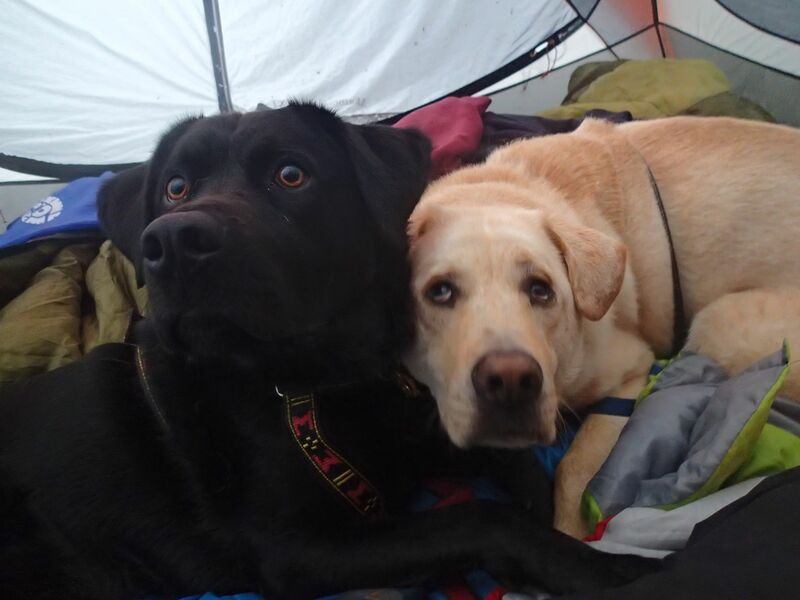 The dogs immediately begged to be let into the tent…in they went, though they appeared a bit worried about the pelting on the roof! 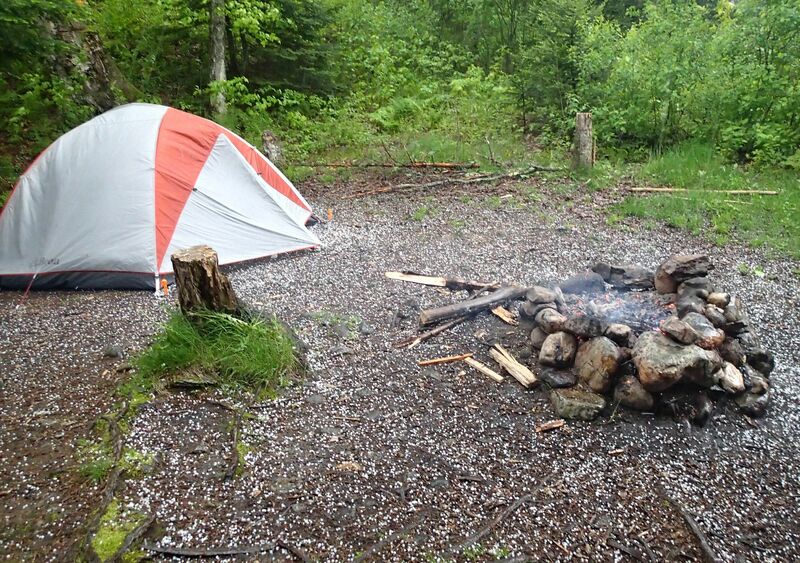 The wind was blowing the campfire flames horizontally–towards the tent–so we quickly doused the fire. After about half an hour, the winds began to diminish, and the hail had turned to a light rain. The campsite looked as though there had been an early snow! By 7:30, the skies cleared, and Griff and I had a short solo around the point. The sky was beautiful, with a rainbow against the dark sky to the south of us. We were able to re-establish a campfire, and enjoy our welcome hot toddies . 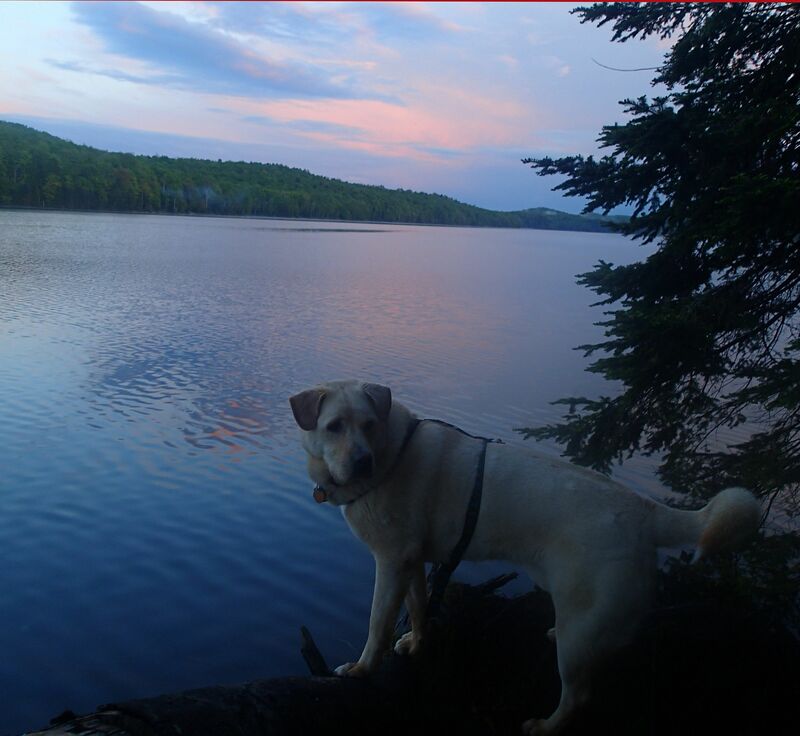 The overnight was marked by a few more showers, and the sounds of loons, barred owls, and geese permeating the evening. Day dawned not with the bright sun, but with some grey coolness….after feeding the dogs, and us, we headed out for a paddle along the northern arm of the lake. 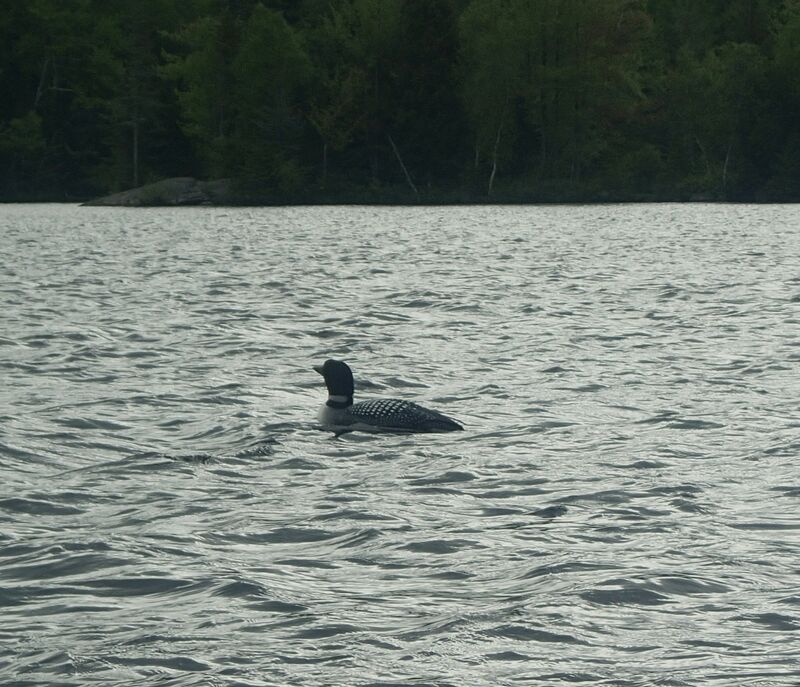 We were greeted by a group of 3 loons, 50 feet off our shore. They ignored us, and we ignored them..the dogs are now so used to the loons, they tend to just accept them as part of the paddling landscape. But the geese were really honking,and the dogs took a good long look at them! 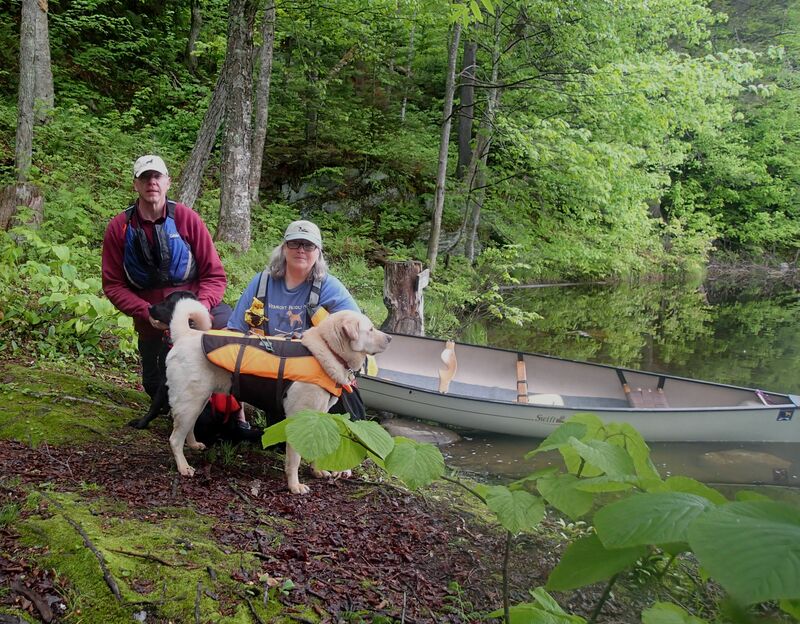 We stopped back at our site, and loaded up the canoe–a brisk tailwind invigorated our paddle back to the take-out. We will return to this lake for more overnight camping in a few weeks…prior to that, we’ll hopefully be able to get out for some day excursions. What a jewel we have available, and only 30 minutes from our home! ← Eluding the rain…enshrouded in the fog….